you earn daily is used to please your financial Gods, not your life." Maya Mathematical Board.............. What did our calculator look like? What did it really happen in 1952 at the discovery of Pakal's sarcophagus? Earth Summit 2002........................ Visual presentation of what Earth has become for the rich and the poor. Mayan SpaceTime........................ Exploring relativity and time travel in ancient times. 2003 Earth Dream Glyph................ A look at the loss of Columbia Shuttle and its seven astronauts.
" We were told to live a good and happy life. 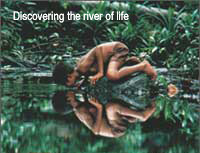 As this poor child drinking from the river he doesn't know the river has been polluted with Evil. You have contaminated the river with your actions and your life. You are responsible too for the death of many children in this planet who innocently drink from the river of life every day. Don't look in the other direction for a solution. The answer is YOU." the Solar Shield, when I bring Powaqqatsi and Mictlantecuhtli down to Xibalba for the last Judgement revealing their real human names: Greed and Destruction." Note: Some files open directly in Flash. Your browser must have the plug-in to view them. the destiny of my life as the last Pakal at the end of the Mayan Cycle. To Mr. Calderon, my DNA maternal memories and Mayan honor.